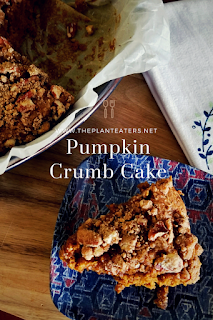 I have to admit I don't really eat a ton of pumpkin dishes or desserts. I did love pumpkin pie before going vegan, and I had a pumpkin spice latte a time or... twenty back then too. But, I haven't ever really been one to make pumpkin cakes or pumpkin brownies. So, here I am telling you I was an idiot, haha. Why didn't you tell me what I was missing?! This Pumpkin Crumb Cake rocked my world! It was so good, I could eat it breakfast, snack, lunch, snack, dinner, and dessert and a bed time snack,which I never do but definitely would if it was this cake!! As per usual it's spiced with the great pumpkin spices that we all love. I leave the measurements of each up to the spice makers because I don't have the patience to figure out which spices I like and of how much. 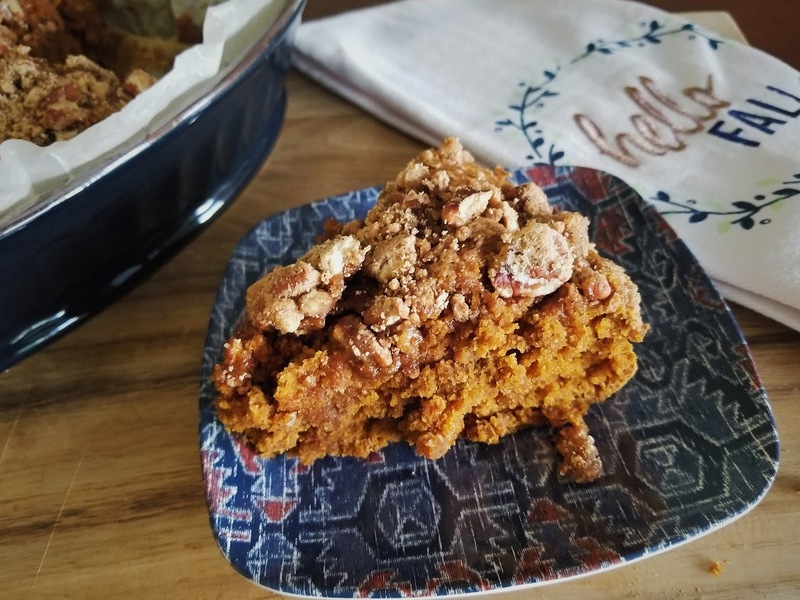 I have tried a few pumpkin spice varieties and I really like this one by.... Ok so I'm done telling you how wonderful this recipe is it's time to make it and devour it for yourself. Here's what I did: Line a baking dish with parchment paper. I used a fancy oval one but a practical square 8x8 one is great too. Preheat your oven to 350 F. In a mixing bowl add the wet ingredients and mix then add the dry ingredients. Mix just until combined and no dry flour is left, don't over mix or it will be tough. Add the cake batter to the prepared baking dish. Now, on to the Crumb topping!! It's my favorite! In a mixing bowl (I scrap the cake batter bowl really well, so I just use it, remember I hate doing dishes!) 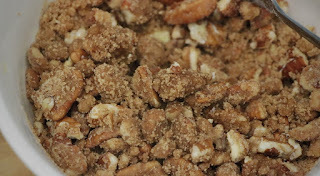 Add the Crumb ingredients in the order listed to make a nice crunchy topping. Ok, I know that's 2 different sweeteners. Let me explain. 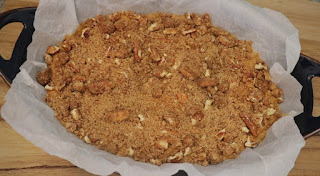 You can use just 1/4 cup of maple and leave out the brown sugar but the brown sugar coated on the pecan with the maple syrup is SO GOOD. It make this amazing candy coating on the pecans that I can't get with out both, so you decide what you want to do. I'll love you no matter what! Mix It all together and evenly top the cake with the Crumb Topping. Pop in the pre heated oven for about 30 minutes. If the top starts to brown and the cake isn't done, cover it with foil. After about 30 minutes. I always do the tooth pick test, in the center and see if it comes out clean, if not pop it back in for about 5 more minutes, test it... you get the idea. Don't over bake it will dry out. When it's done, let it cool for about 10 minutes before cutting. If you make this please please please tag me on social media and let me see your creation! Much LOVE~ Des! What temp should the oven be preheated to? I haven't tried using dates. It would change the liquid to dry ratio so I wouldn't be comfortable recommending it, at this point. If you do give it a try let me know how it goes and what modifications you did. I'd love to try it. Awww Thanks!!! I don't mind a bit, thank you! Please come back as oftenas you like. I love connecting. I'd love to return the favor... I'm so new to blogging, I have idea how to "link" you back, haha. Your blog looks wonder as well! Much love ~ Des! I was wondering about the amount of maple sugar used in the topping. In the ingredient list, it calls for two teaspoons, but the instructions say 1/4 cup. I used two teaspoons and topping came out rather dry looking. Regardless, I can't wait to try it tonight!